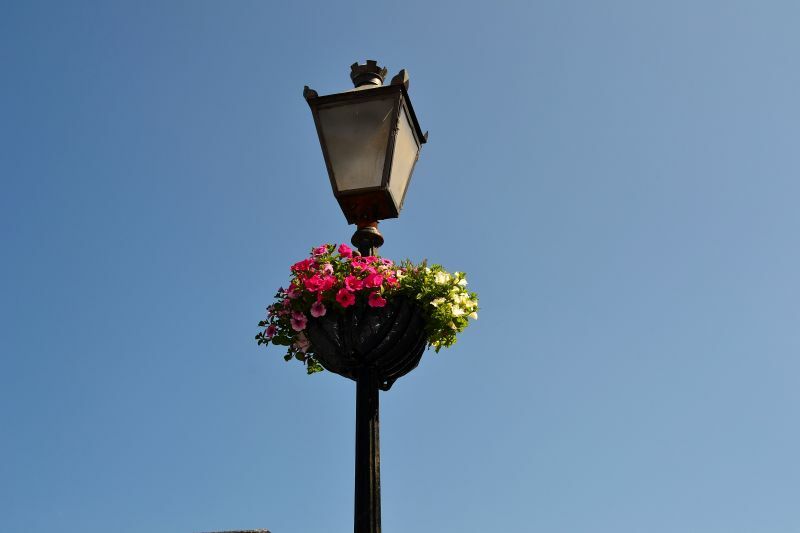 In the Spring of 2012, local business’s came together to sponsor 18 street lamp post hanging baskets all along Main street. AIB Swinford, Card’s & Gift’s Main street and Tower Hardware Main street Swinford, supplied hanging baskets, flowers and brackets. 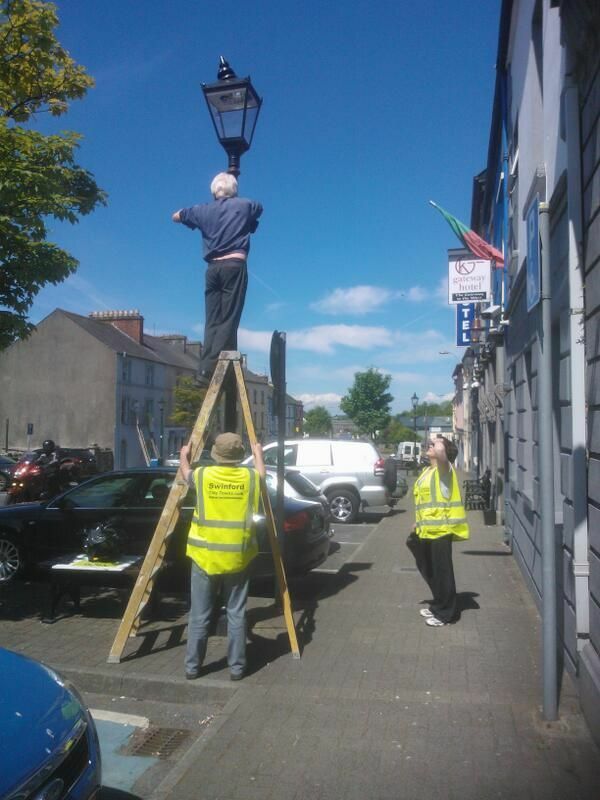 Also a Huge “Thank You” to Paddy Mc Nulty and Jason Hennigan and also Tony Spain, that spent a couple of evenings putting up the hanging baskets on the lamp posts. The following year we made some improvements and added more permanent fixed brackets to the poles. There is a lot of work in planting 18 hanging baskets. It takes a lot of compost and flowers to fill 18 baskets! It took 5 of the tidy towns volunteers a full Saturday to plant all the baskets on the street. This was a lot of “man” hours work. In 2014 we expanded further on the hanging baskets project. We made an improvement on the design by making inserts to fit into the fixed brackets on the poles. This way we can now plant up all the inserts earlier in the spring. By having them planted earlier and in the pollytunnel, giving them a head start. As well as being a lot quicker for putting up every year, (and taking down), they are also well ahead with their growth. 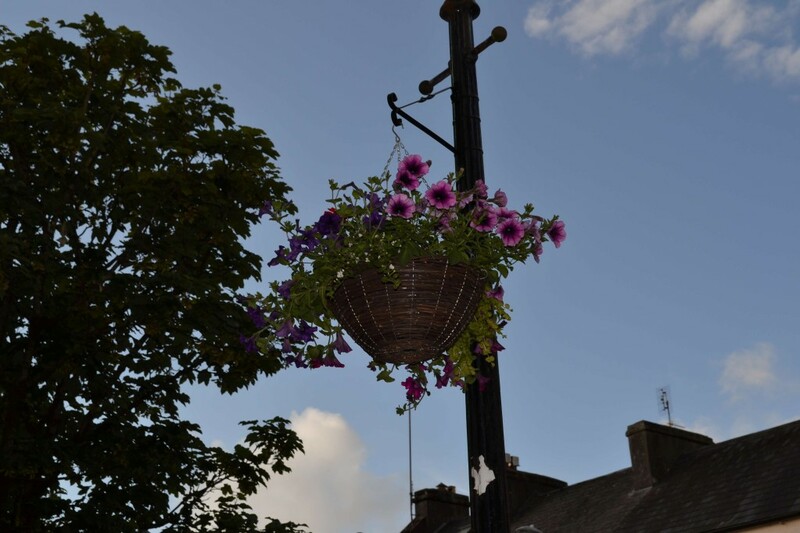 The street lamp posts hanging baskets take a fair bit of maintenance throughout the growing season. For the first month to six weeks they would need watering once a week in normal weather conditions. If it was exceptionally hot or very dry, they would need watering twice in the week. They would also need a liquid feed every second week during the first two months. In the warmer summer months, and when the flowers have grown a lot, they would need watering at least twice a week. Throughout August and September, the watering regime would be three times a week if very dry or hot. They would also get a liquid feed once a week when there is aggressive growth. For the watering and feeding we use an electric pump with a 100 Litre tank that can be connected to a car or van. It takes approximately a full 100 litre tank to water all the baskets. In very warm weather this can double! On average it can take about 500 litres of water a week at the height of the growing season. With this amount of water being used we decided in 2014 to make the hanging baskets more sustainable going into the future. We installed a large 1500 litre rainwater harvesting tank at the “No Name Club” for harvesting rainwater. From the beginning of 2015, the maintenance of watering all the hanging baskets and indeed all the flowerbeds is now fully environmentally sustainable.